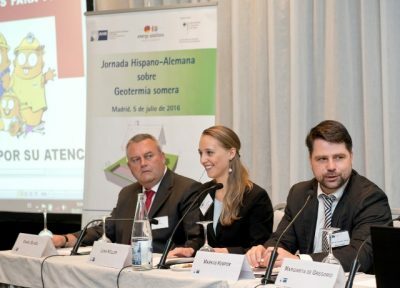 During the Second Spanish-German Day on Geothermal Energy recently held in Madrid, Carlos López Jimeno, Director General of Industry, Energy and Mines of the Madrid Community, highlighted the increase in the number of facilities in the region from 19 to nearly 500 between 2008 and 2016, which translates into about 17,000 kilowatts of installed power. He also explained that 80 percent of facilities use vertical geothermal exchangers with soundings between 10 and 250 meters deep. The opening of the conference was also carried out by Walther von Plettenberg, director of the German Chamber of Commerce for Spain, organizer of the event, and Carolin von Buddenbrock, head of the section of Economic Affairs of the German Embassy in Madrid. On behalf of the German Ministry of Economy and Energy, Lena Keller, from Eclareon consulting briefly explained the roadmap and objectives of the “Energiewende” in her country. Then Margarita de Gregorio, of the Spanish Geothermal Technology Platform, GEOPLAT, noted the lack of an official register of renewable thermal installations in Spain, which makes it difficult to know the real situation of the sector. According to their estimates, 70 percent of installed capacity corresponds to the tertiary sector (hotels, shopping centers, etc. ), 20 domestic and 10 to direct uses. She concluded with a strong argument in favor of the energy from the ground: geothermal energy favors the economy and local employment. 70 percent of the economic activity generated by geothermal energy, she claimed, is due to Spanish companies. Claus Heske, new director of the International Office of Geothermal Energy, highlighted the parallel use of geothermal energy in hybrid installations, ie providing heat in winter and cold in summer to buildings. Heske outlined three major advantages of this renewable source: it is easy to use, requires little maintenance and gives boost to local business fabric. In this regard, the company Thermosolar showed the savings in energy costs that can be achieved using their hybrid system consisting of flat solar vacuum panels and geothermal heat pump through a real case: a family house of 250 m2 in Germany whose spending for heating and electricity stands at around € 340 per year. Celestino Garcia Noceda, geothermal research project leader at the Geological and Mining Institute of Spain, stressed the great resources of the Canary Islands where high temperatures for direct use or production of electricity are found at shallow depth . He also made clear that what is needed to carrying forward the geothermal energy sector is “decision and support of the Administration”. Javier Urchueguía Schölzel, Professor of Applied Physics of the Polytechnic University of Valencia and President of the European Geothermal Energy Panel, opened his remarks by noting the importance of R + D + i for the entrepreneurial world. “It is a tool to enter new markets,” he said, citing examples of collaboration of companies and institutions of both countries in European projects. Urchueguía anticipates a high potential for geothermal energy in geo-structures such as thermoactive piles and foundations and Heating + Cooling hybrid applications. He concluded by emphasizing the important role of the European institutions for the proper development of the sector and to ensure the quality of the facilities. The day concluded with the presentation of a case study jointly exposed by Alfredo Montero from Sacyr Industrial and Javier Paje, representative of the Owners and developer of the 21 Villas of Nuevo Tres Cantos. Then a networking session between companies of both countries pre-organised by the German Chamber of Commerce for Spain took place. Several bilateral meetings were held on the 6th and 7th July at the headquarters of Spanish companies throughout Spain. During the so-called Trade Mission a total of 40 individual meetings between German companies and local entrepreneurs interested in learning about geothermal solutions were held.